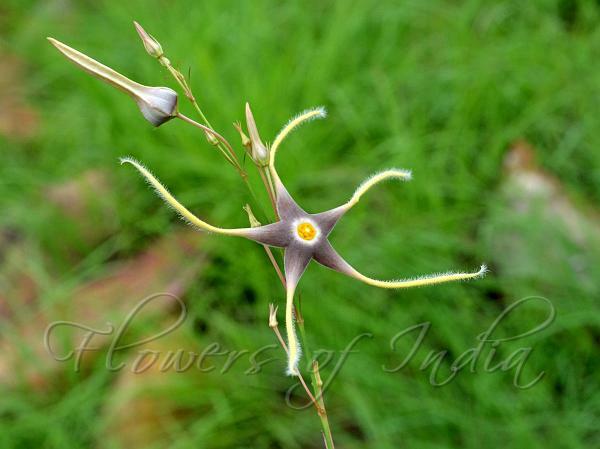 Andhra Spider Star is a critically endangered perennial herb, up to 1.6 m tall. Tubers are up to 8 × 4 cm, spindle-shaped or spherical, brownish. Stem is erect, solitary, round, unbranched-sparsely branched, filled with watery sap, hairless, green, white glaucous downwards; nodes purple-tinged; internodes up to 15 cm long. Leaves are up to 12 × 0.2 cm, linear or thread-like, simple, opposite, decussate, fleshy, stalkless, pointed at tip, entire, hairless. Flowers are borne in	leaf-axils, in stalkless or shortly flower-stalked clusters, usually with erect, solitary flower or 2-flowered, very rarely 3-flowered. Flowers are carried on 1.5 cm long flower-stalks, round, hairless. Calyx is 5-lobed; sepals up to 5 × 1 mm, linear, pointed or tapering, 5-veined, hairless, pinkish-green. Flowers are 5-lobed, spindle-like, star-shaped, ash-grey up to basal narrowed portions of lobes, striations white, appearing like a ring surrounding the corona. Flower tube shallow; petals up to 3.6 × 0.2 cm, 5-veined, linear portion pale yellow, pointed, occasionally blunt due to inturned tip, margins folded back along the middle, prominently hairy throughout, occasionally finely velvet-hairy or hairless near base. Corona is about 3 mm across, biseriate, hairless, yellow. Seed-pods are about 10 cm long, paired, erect, divergent, splitting open. 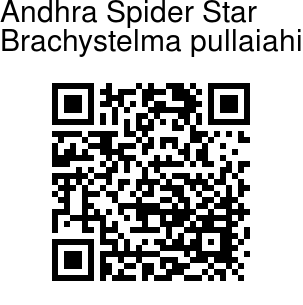 Andhra Spider Star is a newly described species, found in Andhra Pradesh. The species is named in honour of Dr. T. Pullaiah, Professor of Botany at Sri Krishnadevaraya University, Anantapur for his contributions to the floristics of Andhra Pradesh. Identification credit: Siddarth Machado Photographed in NSTR, Andra Pradesh.